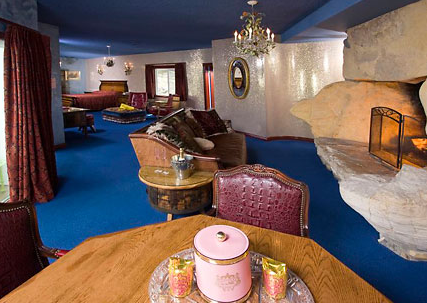 Unusual & themed hotels in California, USA. Unique hotels in California, ideas for romantic getaways. One of the most unique & themed hotels in California, USA. This luxury hotel features 10-acres of beautiful rancho-style architecture, elegantly appointed San Diego accommodations, and lush gardens amid Southern California’s temperate climate. This hacienda style & themed hotel in San Diego offers the perfect setting for rest and relaxation. Award-winning landscaping of native plants, unique botanical gardens, a heated pool and whirlpool, and plenty of oversized rocking chairs to relax the day away. 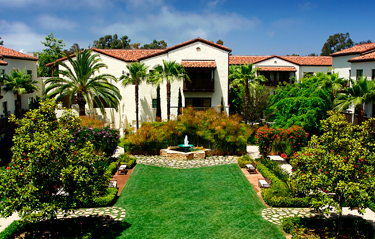 Estancia guests can also experience rejuvenation at San Diego hotel spa. 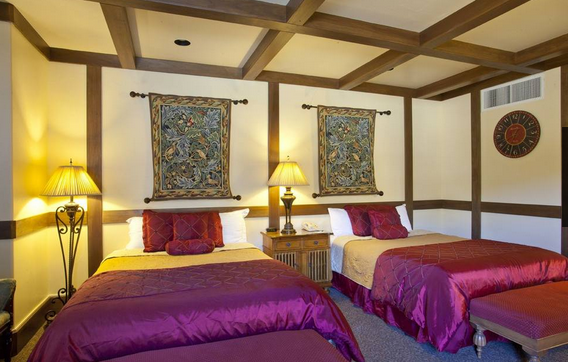 One of the most romantic themed hotels in California for romantic getaways in USA. As an international landmark destination, Madonna Inn redefines unique with whimsical guestrooms, enchanting décor, and resort amenities, including a luxurious Spa, horseback riding, boutique shopping, terrace pool and bar, and two award-winning dining experiences. Some of the themed hotel rooms are: American Beauty, Anniversary Room, Antique Cars, Barrel of Fun, Bridal Falls, Buffalo Room, Canary Cottage, Caveman, Cayucos Queen, Country Gentleman, Desert Sands, Floral Fantasy, Golfer’s Room, Krazy Dazy, Love Birds, Madonna Suite, Mountain View, Old Fashion Honeymoon, Romance, Vintage and much more. One of the most unique hotels in California, USA. Once a world-class ocean liner, the Queen Mary Hotel offers guests unique accommodations and a wide array of attractions. One of the unforgettable themed hotels in California, USA for romantic getaways. Whether it’s the authentic polished wood paneling, the original 1930s artwork, the Art Deco style or the operable porthole(s), there’s no question that the Queen Mary Hotel is a great romantic & wedding destination. 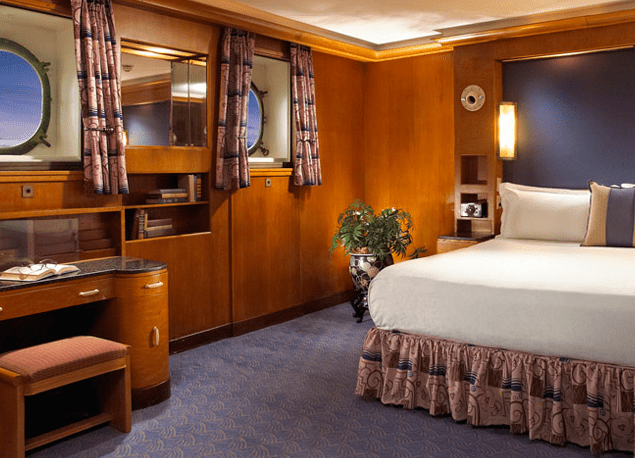 Each stateroom is unique with its own personality and offers a real glimpse into what transatlantic travel was like during the 30’s, 40’s and 50’s. From historic tours, to paranormal attractions, shops, spa and various events, there are a wide variety of things to do and see while aboard the ship. The San Luis Creek Lodge is a charming, family owned and operated San Luis Obispo bed and breakfast inn with the amenities of a small upscale hotel. It is the perfect Californian getaway. One of the unforgettable unique & themed hotels in California for romantic vacations. The hotel’s rooms have their own unique decor and charm. All rooms have beautiful, spacious bathrooms. The hotel’s three buildings, with their distinct architectural styles. appeal to a wide variety of guests. Some of the themed hotel rooms are: Kensington, Nottingham, Newcastle, Windsor, Canterbury, Oxford, Buckingham and more. 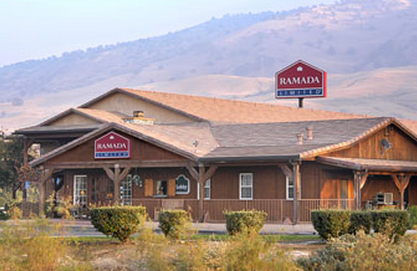 Relax in the rural ranch setting of our Ramada Limited Lebec hotel near Fort Tejon State Historic Park. The hotel is within easy driving distance of area attractions and restaurants, and provides the perfect spot to relax at the end of a full day. The hotel offers also a heated outdoor pool, spa, courtyard barbeque area. This pet-friendly hotel offers guest laundry services and free high-speed Internet access. Handicapped-accessible rooms are available. One of the unique country themed hotels in California, USA for romantic getaways or vacations.